Can healthy recipes taste really delicious too? I know the answer is yes, absolutely, and for my proof, here is exhibit A: cheesy broccoli skillet potatoes. These warm skillet potatoes, with a creamy cheddar sauce, are savory, flavorful comfort food at its best. This is a dish that’s tasty and satisfying enough to please every person at the table. 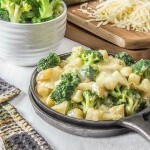 These cheesy broccoli skillet potatoes work great as a side dish or, served with soup or salad, as a light meatless meal. 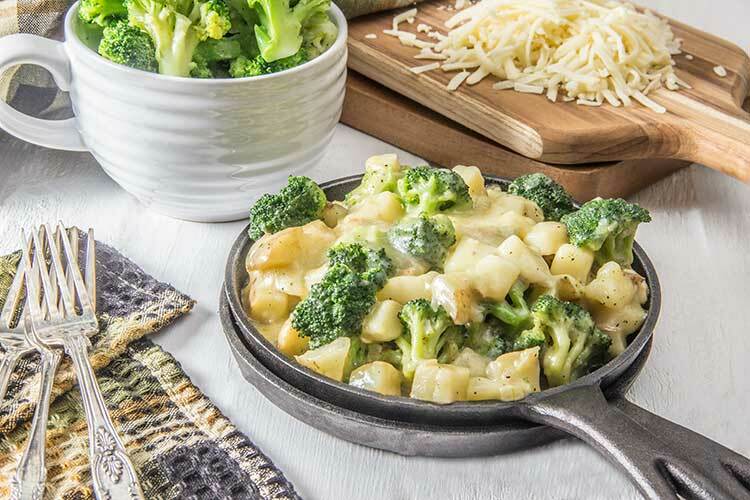 But with all of the fresh, whole ingredients – like white potatoes, broccoli, onion, and olive oil – these skillet potatoes are also filled with plenty of healthy nutriention too. They’re so richly flavorful, hearty, and indulgent-tasting. But’s it’s nice to know this dish is filled with healthy ingredients too! Add 1 Tablespoon olive oil, garlic, and onion to a deep sauté pan. Cook over medium heat until garlic and onion are fragrant and lightly softened, about 2-3 minutes. Add 1 Tablespoon olive oil and potatoes, and season with salt and pepper. Cook, stirring frequently, until potatoes begin sticking to pan. When potatoes begin to stick, add about 1/3 cup of vegetable broth and stir. Continue to cook, stirring frequently, adding about 1/3 cup vegetable broth each time the potatoes begin to stick to the pan. When potatoes are fork tender, after about 20 minutes, add the thawed broccoli florets and riced cauliflower. Season with salt and pepper, and stir until well combined. Turn off heat and add cheddar cheese. Stir until combined, and add vegetable broth, about 1/3 cup at a time, until a thick and creamy sauce consistency is reached. Season to taste with salt and pepper. Serve.